Delphi Display Systems, Inc. has introduced the Digital Sidewalk SignBoard, a combination digital signage display and traditional chalkboard. Delphi's Digital Sidewalk SignBoard combines the digital flexibility of a 22-inch sunlight readable LCD with a traditional chalkboard. 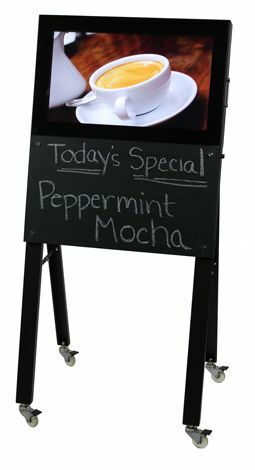 Developed for indoor or sheltered outdoor use, the Digital Sidewalk SignBoard is designed for sidewalk cafes, sandwich shops, coffeehouses, boutiques, clubs, and other businesses that desire to entice customers with crisp, impactful digital images or videos along with messages that can be written and changed at any time -- with a personal touch. Digital images or videos are easily customized and updated through a standard USB thumb drive. The digital screen rotates images and/or videos to spotlight key menu items or promotions. The SignBoard also supports high-resolution video. The chalkboard can be used to present daily specials, prices, promotions or daily activities and start times. The Digital Sidewalk SignBoard's LCD is protected with an all-glass front window with black glass bezel. The LCD and 24" black chalkboard are integrated into a foldable A-frame easel on wheels for mobility within and outside a restaurant or business. "We believe there are a tremendous number of applications for the Digital Sidewalk SignBoard and are excited to assist our customers in implementing it to benefit their businesses," said Ken Neeld, President and CEO of Delphi Display Systems. "Delphi is known for driving the industry with unique outdoor digital display technology and we are proud to add the Digital Sidewalk SignBoard to our product line."